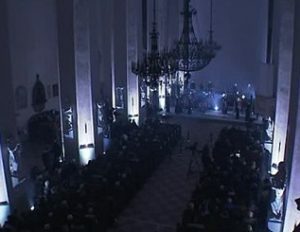 On 12 January, 2019, students of the Lithuanian Academy of Music and Theatre played at a concert “In Memoriam” at the Churche of St. Johns in Vilnius, dedicated to the January Events. Students of LMTA Department of String Instruments and LMTA Departament Wind and Percussion Instruments appeared on stage alongside the New Ideas Chamber Orchestra NICO. These students are Rūta Šeduikytė, Artūras Maniušis, Džiugas Daugirda, Agata Ursul, Vilija Bogušaitė, Kotryna Ugnė Daunytė, Jonė Barbora Laukaitytė, Beatričė Marcinkutė, Jokūbas Švambaris, Birutė Ilčiukaitė, Dovydas Bulotas, Karolis Vaičiulis, Šarūnas Pozniakovas, Aušvydas Kriščiūnas. Programme of the concert featured Alfred Schnittke’s opus “Sutartinės”, that was created by composer immediately after the January Events. Interpretation of Schnittke’s work was prepared by compositions of NICO artistic director composer Gediminas Gelgotas (“Sanctifaction”, “Mountains. Waters (Freedom)”, “Echoes for the Thousand Years”, “Transitory”). At the end of the concert, the National Anthem of Lithuania composed by Vincas Kudirka was played.